Usually when a person rents a property, he signs a rental agreement with a fixed lease period at the end of which the lease has to be renewed or the person is expected to move out. When it comes to a month to month rental agreement, the lease is renewed at the end of every month. This means that the owner can alter the rental terms any time he pleases. Drawing such an agreement becomes easy when an Agreement Forms is used. As the name suggests, this is a short form of a month to month rental agreement. So, only the basic information and requisite clauses are entered in the agreement as compared to the long spun contracts that are generally used. Nevertheless, these are just as effective. When a room is rented out to a tenant, this form can be used to draft an agreement with all the requisite details and terms in place. 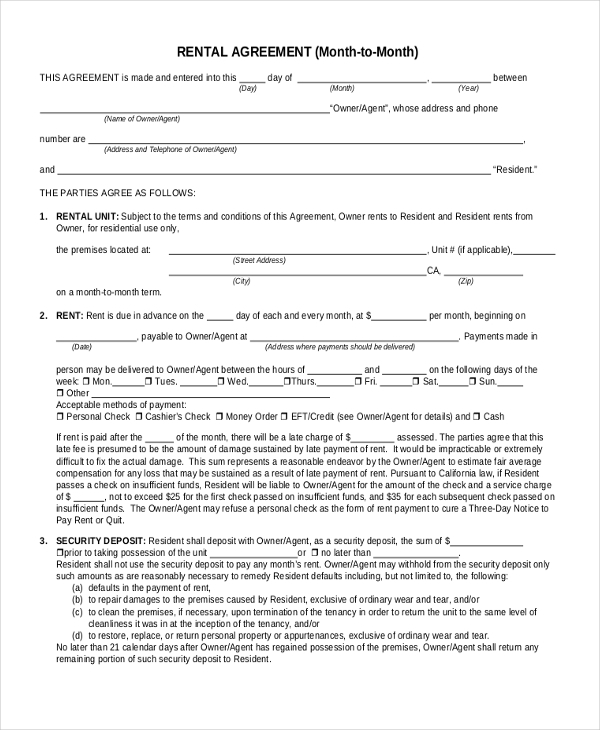 The owner and the tenant should then sign this agreement to legalize the whole transaction. When a residential property is rented out, the owner can make use of the aforesaid form to get an idea of the right way to draft a proper month to month rental agreement. With all the segments in place, this is definitely quite easy. 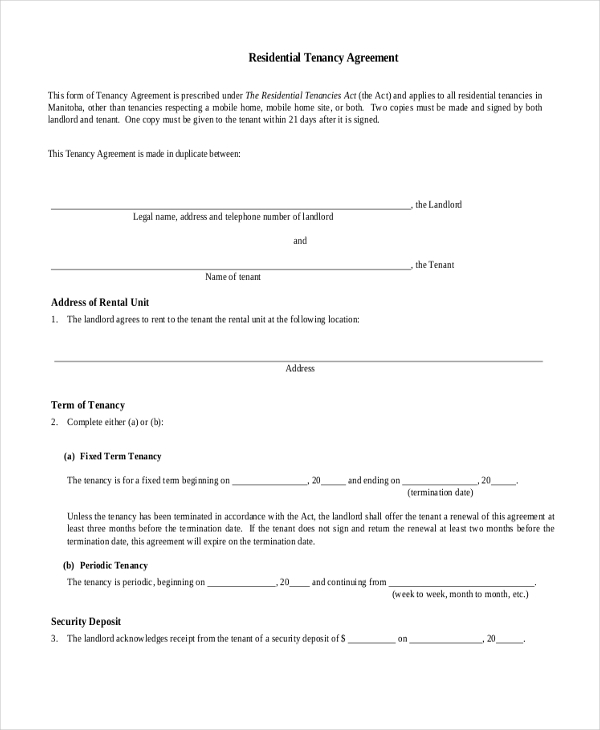 A person who wishes to rent out his commercial property can use this form to draft a rental agreement with all the required clauses that he and his tenant are bound to follow. 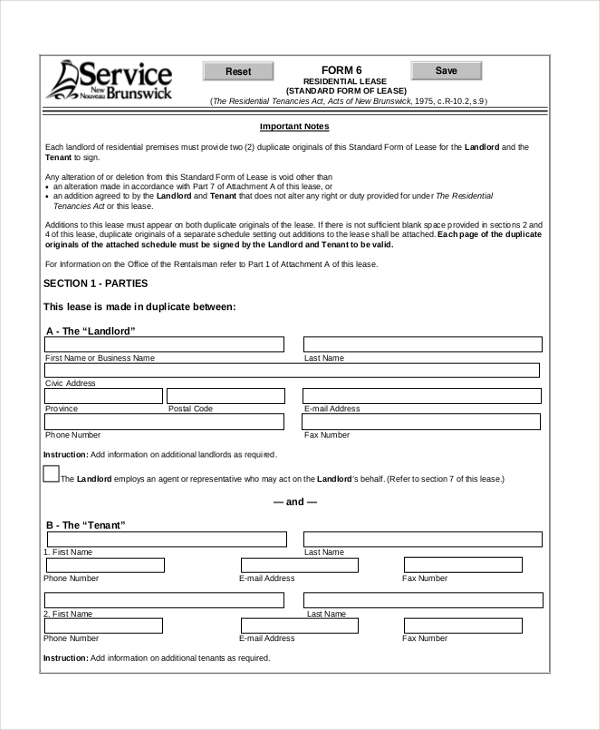 This form with its proper format and segments simplifies the agreement drafting process. This is a standard design of a month to month rental agreement which gives the user an idea of the format to be followed and the segments to be included in such an agreement. The user can alter the content as per his requirements. 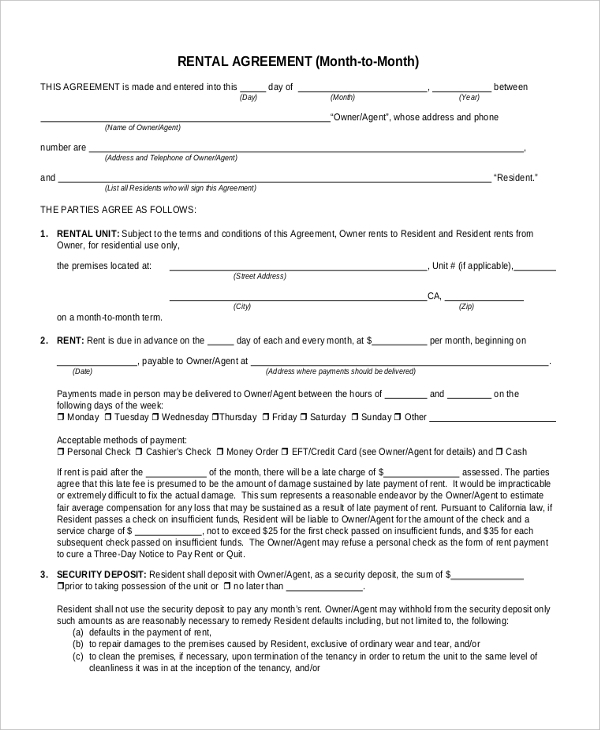 A person who wishes to draft a month to month rental agreement can make use of this form for the purpose. This form comprises of an acceptable format and the essential segments, thus making it easier for the user to draw the agreement quickly. 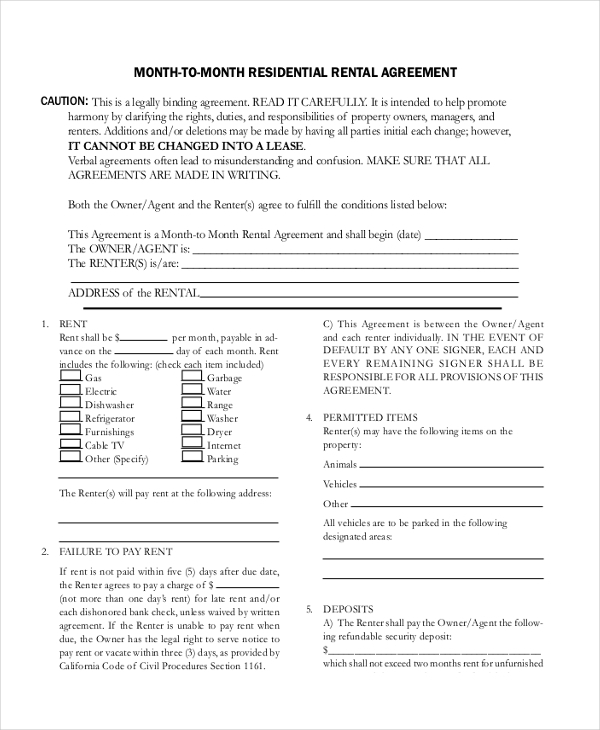 This is a sample of a month to month rental agreement and can be used by any person irrespective of the kind of property that he may be willing to rent out. This form comprises of crucial clauses and terms. However the user can add or alter the terms as per his needs. This is a general design of a month to month rental agreement with all the required segments, clauses and subheadings in place. The user can use the form just as it is or can make changes to it before personalizing it with the details. 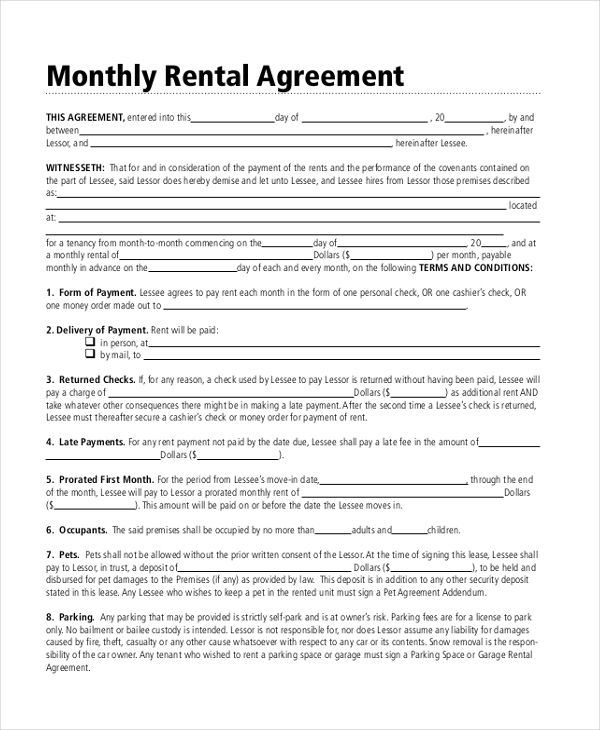 What are the Benefits of Using Month to Month Rental Agreement Forms? In case you need some assistance to draft a month to month rental agreement, take a look at the wide range of month to month rental agreement forms that we have to offer. You are sure to find one that will be apt for you. Download this and then customize it as per your needs. These forms are print ready and compatible with all devices.